NEW YORK—The opening shot is an unfocused patch of dirt. It’s not what you’d expect from a documentary titled “Cameraperson,” a documentary about documentaries and a visual memoir of cinematographer Kirsten Johnson’s 25-year film career. “For a long time I struggled with—I was trying for a really long time to get this beautiful shot as the opening,” she said. “But that’s not what I’m trying to talk about [with the film].” She realized it was not about showing what beautiful camerawork she could do. That wouldn’t come close to communicating her experience as a cameraperson. With “Cameraperson,” which opens on Sept. 9 in New York, Johnson wanted not just to document her career, but also to communicate her personal experience and the issues she juggled from behind the camera—ethics, humanity, power—to the audience. “We wanted the audience to be as empowered as possible to think for themselves,” she said. The documentary is a compilation of footage shot during the making of 24 films, plus additional original footage of her family. Included in Johnson’s camera credits are many documentaries that dealt with the big questions in society. “Election Day” (2007) showed the on-the-street experience of American voters; “Darfur Now” (2007) examined the genocide in western Sudan; “No Woman, No Cry” (2010) told the personal stories behind the statistics of the 500,000 deaths each year caused by inadequate health care obtained during pregnancy; “Citizenfour” (2014) captured the first meetings with whistleblower Edward Snowden; and “Risk” (2016) tells the story of WikiLeaks editor-in-chief Julian Assange. Yet, documentaries are not organic. Everyone on the scene influences the story being told. In “Cameraperson,” Johnson gives us behind-the-scenes glimpses into what it means to tell people’s stories through imagery. The conversations are intimate and the implications are thought-provoking. The footage addresses storytelling, trust, political repression, surveillance, censorship, freedom, presence, and much more. Twenty-five years of footage is a lot to work with, but “Cameraperson” found a solid story in the editing process. Johnson partnered with editor Nels Bangerter, who won acclaim for his work on the 2013 documentary “Let the Fire Burn” (composed exclusively of found footage). The result is an incredibly deliberate narrative. The film invites the viewer to think about the impact the cameraperson has on the scene being shot, on the story being told, before navigating through a journey of interactions with people from all walks of life, in all sorts of places. Meanwhile, the viewer is aware that he or she is now viewing Johnson viewing the world. Johnson is hyperaware that the story told in the final cut of any documentary is just one of many storylines that unfold at one time. The drivers, the translators, the sound crew—everyone involved with the making of a documentary is involved with the creation of the story being told, and everyone is aware of the effect of their presence, she said. “There are always other storylines going on when you’re making a documentary, and no one really sees that,” she said. She might want to follow an interesting-looking person walking down the street but can’t, or itch to capture something happening behind her, and her areas of interest have shifted over time through the different stages of her life. The dilemma Johnson faces is most present when the needs of the people she witnesses are “so acute and so visceral,” she said. It’s not always such a clear dichotomy. There was no time to ask for permission to film. The crew drove their car past the people helping the woman, up onto the hill they were ascending. Then Johnson came out of the car with the camera to capture the scene. “The people are looking at me, as they’re carrying the woman up the hill, like, ‘What kind of human being are you? How can you be doing this to us?’, and that, I could see in their eyes,” she said. Immediately after, the crew helped the woman into the car and drove her to the hospital, where she had her baby and named it after the driver. We have all seen images of impoverished children in Haiti, who did not have the power to say no to being filmed, Johnson added as another example. How much impact is that having? Over the course of her career, what she has allowed herself to film or decided she could not film has changed, sometimes even from shot to shot. Things flip quickly in their meaning. The ethical limits are a moving target. There are shots she has done but refused to do again because she felt they betrayed her humanity and the humanity of the people she filmed. There are also situations that are the opposite. She remembers filming in a jail, escorted by a police officer whom she’d asked to gain the permission of those jailed before she started filming. The police officer did not ask, and instead led Johnson through the jail, using her and the camera as a show of his authority. “I think that in my younger years, I probably would have turned off my camera in the moment when everyone was questioning me and saying, ‘You can’t do this to us,'” she said. But, realizing there were more complex dynamics in place, she didn’t, and told the people she wouldn’t film their faces as she went through. “He said he had a misdemeanor, was poor, and couldn’t pay this fine,” she said. “He suddenly realized the camera could give him a voice. … That shift happened because I didn’t turn the camera off. Actions have consequences. But where the responsibility falls is not clear. If being on the scene inherently impacts the outcome of the story, Johnson has played a part in many things in history and the future that she cannot even begin to fathom. In one film, for which her crew followed a public defender in Washington, Johnson spent a lot of time with a group of youths in the criminal justice system, and even taught one of them how to drive. She listed a few things she felt were outcomes of the documentary: a viewer ended up giving a huge donation to the school featured; the documentary ended up being the only footage the mother of one of the teens had of him after he died; one of the teens was later arrested for hijacking a taxi at gunpoint. “There’s no balance scale in the world that can say where that ends up,” Johnson said. Many of the documentaries Johnson works on are in locations or related to issues where political oppression is at play. An interviewee may consent to being filmed and be imprisoned for it two years later. There are cases where “if you say something on camera, it can mean your life,” Johnson said. Yet it is not all her responsibility as a cameraperson, nor is it the director’s, nor of the people being filmed. This is an increasingly pressing issue in the world today, when images are being transmitted at a rate that far outpaces any other time in history. People are used to having their images captured, and sometimes that changes contexts and conversations. Technology has enabled us “instantaneous access to all of us,” she said. “The ideas of what does it mean to be a human and imagery, this is a very huge dilemma for all of us,” Johnson said. Not that the film, nor Johnson, is a downer. “I want people to walk away full of love for the world, and also full of questions about what images mean to all of us,” she said. Johnson has always been drawn to questions of social justice and why it does or doesn’t happen, and has committed herself to recording human rights issues. She is currently working on multiple projects simultaneously and exploring questions related to how we react to violence in imagery. Her journey toward becoming a cameraperson began with her examining the idea of racism, which led her to a film by Ousmane Sembène. “I kind of had my mind blown by his different way of showing the world,” she said. Sembène, who has been called “the father of African film,” made films touching on issues like the history of colonialism, religion, and African societies. After graduating from Brown University with a degree in fine arts and literature, she traveled to Senegal to study with Sembène and acclaimed filmmaker Djibril Diop Mambéty, and then from there to the La Fémis film school in France. She’d been advised that if she applied for a spot in directing, as an American, it was a lost cause. She was accepted to study cinematography, picked up a camera, and fell in love. Access is one of her biggest considerations when it comes to weighing whether she will work on a documentary, as filmmaking is all about constraints. Because even if the director is inexperienced or the crew is limited, just having a camera there gives the capacity to film evidence, document history. 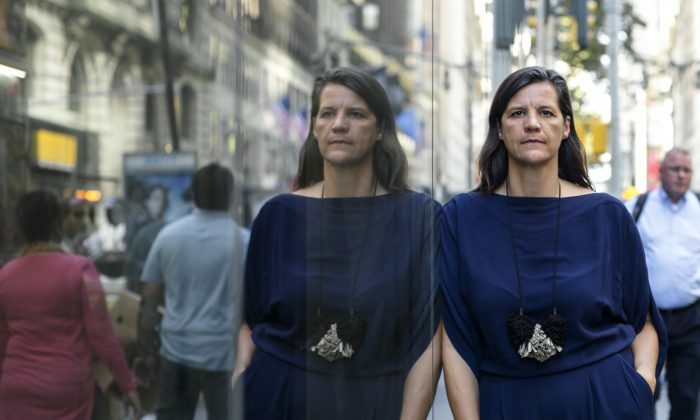 One of her longstanding collaborations is with Oscar-winning filmmaker Laura Poitras, who directed “The Oath” and “Citizenfour,” and one of the reasons is Poitras’s amazing ability to gain access. “One of her ways of working is finding the people who are at the center of what is a profound social dilemma,” Johnson said. In “The Oath,” Poitras somehow was able to find the people “who were at the very center of things” in the post-9/11 world, Johnson recounted. She tracked down Osama bin Laden’s bodyguard and his driver. “And for me to sit in that trial in Guantanamo Bay and witness that, that was a profound experience of being in history. In snippets of slivers of stories,”Cameraperson” gives the viewer a glimpse into various lives. A Nigerian midwife, a boxer in Brooklyn, women in postwar Bosnia and Herzegovina, characters telling traumatic stories and hopeful stories. It also includes intimate, highly personal original footage of Johnson’s mother, a scene that was an important revelation for Johnson. She had filmed a conversation with her mother while her mother could not remember who Johnson was. “Sharing that felt really important to me,” Johnson said. At one point they had considered using voice-over, but Johnson realized everything she said was too much and yet there was no way to say enough. It was overwhelming—for her—and felt oppressive, unwatchable. They realized it was not the language of the film.